A Top of The Line model for Silvertone in 1936. 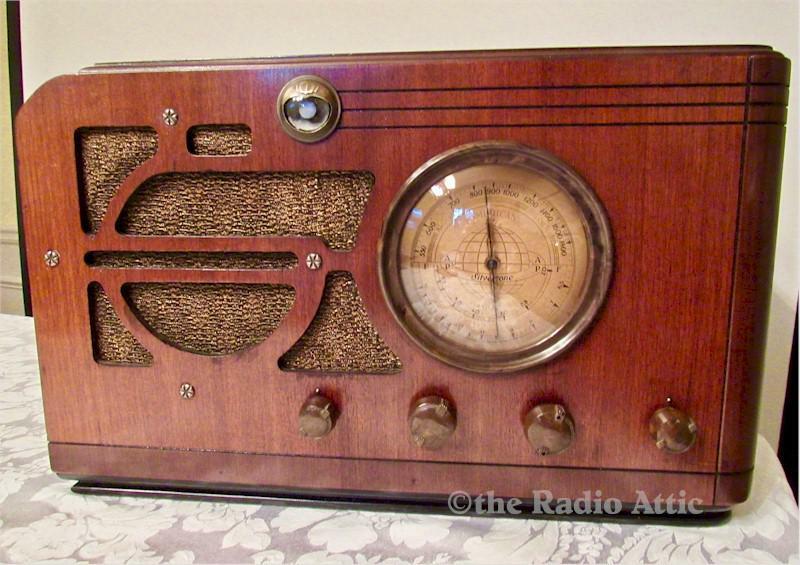 Beautiful gold dial, magic tuning eye, airplane style dial pointer, original finish on the stylishly designed cabinet, original grille cloth, original knobs, just a lovely, original radio someone must have cherished, as it is in such nice condition. This is the first time this model has been seen and offered on The Attic and is considered difficult to find. The cabinet was carefully cleaned and polished, preserving its beauty and luster. The electronics have been completely restored (no shortcut repairs and it is internally fused for your safety). It plays very nicely on the AM broadcast band and both shortwave bands through its large speaker. In addition to adding a MP3 input, I am including a Bluetooth receiver, so you can directly connect your MP3 device or stream your own music using your own Bluetooth device (smart phone, tablet, etc.). A superb preserved original specimen suitable for any discerning collector. 16-1/2"W x 10-1/2"H x 8-1/2"D.